Update (Feb 6, 2019): Lumenzia v7 is now available! I’m excited to announce that version 5.0 of the Lumenzia luminosity masking panel for Photoshop is now available as a free update for all customers. This update includes over 100 improvements, so there is only room to highlight a few in this post. Please see the release notes for a full list of new/updated features and bug fixes. And be sure to see the written manual and tutorial videos, as both have been updated and expanded significantly. While everyone uses the term “luminosity masks”, the real star of the show is actually “luminosity selections”. Luminosity selections are the foundation of exposure blending, dodging and burning, and many other advanced workflows. In the past, they’ve been difficult to customize and visualize. Not any more. “✓Sel” to visualize selections just like a mask! No more confusion with invisible selections or marching ants. You can now view the active selection as a full screen black and white preview (ie, just like a mask). This is very helpful to see your exact luminosity selection, when trying to confirm edges of the current selection, modify selections, or other situations where the current selection is not obvious. Click once to see the preview, and a second time when finished with the preview. “✓Sel” also allows you to refine any selection just like a mask! Adjust the preview you see with “✓Sel” any way you want, and then click “✓Sel” again to re-load the selection. You can brush, use levels, or make any other adjustment as you normally would if you were working on a mask. A new Live Selection (LIVE-S) mode! Make luminosity selections instantly, for faster dodging and burning, exposure blending, or other situations where you need to paint through a selection. Click on the mode button at the top of the panel to set LIVE-S mode and then click any preview button to create a selection. Use the modifier keys to add, subtract, or intersect for advanced selections. Note that the “hide marching ants” preference is ignored in this mode, as there is no preview step to visualize the selection. Live selections will ignore the new “zone map” if visible, so you may make normal selections while using the map as a guide. (Live Selections are available on CC only). New: Add, subtract, or intersect selections! The new +/-/* modal buttons at the top of the panel allow you to add, subtract, or intersect (multiple) luminosity selections. So you can, for example, create an L3-L6 selection to target light tones without affecting near-whites. The saved selection dialog in “Sel” now has dedicated buttons to add/subtract saved selections as well. New: Set a preference to “Hide Marching Ants” in the CC 2015.5+ panel. When this is checked, selections created by Lumenzia will not show marching ants. You may still use <ctrl/cmd>-“Sel” to temporarily use the opposite of the default. Vector Masks and expanded support for BlendIf Masks now offer even more options to keep your files lean and flexible. Combined with existing support for BlendIf masks, “Combine” and Lumenzia’s non-channel based workflow, you can dramatically reduce the size of your saved files. Vector masks! Just like BlendIf masks, these new masks are designed to keep your files very small and let you make further refinements. And you can use them on the same layer as a layer mask, which gives the same results as a group mask, but without the clutter. They’re an excellent new alternative to using lasso selections. Just -click “Mask” to render any path or selection as a vector, or check the preference in CC 2015.5 or later (under the three bars icon at top right where all preferences are set). 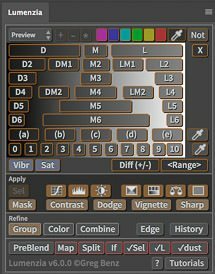 Setting the preference allows vector mask to be used with all the orange buttons (curves, levels, contrast, vignette, sharpen, etc). Support runs throughout Lumenzia as much as possible (when combining masks, vector masks will automatically be rasterized to layer masks). Note that if you’d like the luminosity mask (orange preview layers) rendered as a vector mask, use “Sel” to convert it to a selection first, and then use “Mask” to apply it as a vector mask. BlendIf Masks can now be automatically created when using “Contrast”. This provides a similar contrast adjustment, but with the space saving and dynamic updating capabilities of BlendIf. Many of you have asked for more options to help visualize the tones in your image. With zone maps, you can now more easily see if your image is heavy in the shadows or highlights, pick the right zone mask, etc. And it is built to be interactive, so that you can see the zone mapping of your image update live as you make changes in your image. Zone map visualization. Click the new “Map” button to show or hide a spectrum showing the various zones in the image (red = zone 0 through violet = zone 10). While the zone map visualization is on screen, the zone buttons in Lumenzia will turn colors to help serve as a reference for the color mapping. Linked PSB support allows you to create files of nearly unlimited size, and still see them within Lightroom. Several operations are up to 3X faster when working with large files. Smart Object Sharpening. Use a completely non-destructive workflow with this new option. The current layers are converted to a smart object, and sharpening is added as a filter (with settings designed to help minimize halos along bright sky edges). I find that this approach generally yields better results than high pass sharpening for landscapes. Edge protection for smart filters. When you sharpen a smart object (using the new object sharpening in Lumenzia, Nik Sharpener, etc), you now have a simple way to help reduce any halos you may find along edges. Panel tips! See helpful tips immediately at the bottom of the panel as you hover over the buttons. This is available on CC 2015.5 or later only. This option is disabled by default (the legacy tooltips remain the default, but may be turned off by the user). Just click the three bars icon at the top-right of the panel and choose “Tool Tips” to change preferences. Support for Paths throughout Lumenzia. You can now use paths the same way you’ve always used lasso selections in Lumenzia. This is a great option for black and white architecture or other work where you need to use both luminosity masks and hard-edged masks. And your paths can be converted directly to vector masks (when the preference is enabled in settings) to give allow you to revise your path at any time. New: Lumenzia actions. Need to create a light or dark mask/selection? Lumenzia now includes actions you may incorporate into your own automated actions. Great for batch processing or other repeatable/repetitive workflows. A new “Optimize Photoshop” utility which runs a check on several Photoshop settings and makes recommendations that may help improve performance of Photoshop for luminosity masking and Photography in general. 10 new tutorial videos showing how to make the most of new features, with many more to come over time. And so much more. There are over 100 enhancements to Lumenzia and the Basics panel. For a full list of changes, please see the release notes.